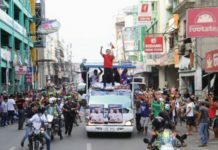 GUIUAN, Eastern Samar- The Russian ambassador to the Philippines has vowed to help the local government unit of Guiuan and the President Elpidio Quirino Foundation in their campaign to let more people learn about Tubabao Island and the plight of “White Russians” who lived there, 69 years ago. Ambassador Igor Khovaev said the campaign will help not only in strengthening the ties between the two countries but will also pave the way for more Russian tourists to visit, especially Tubabao Island. About 6,000 White Russian refugees from China stayed on Tubabao Island, this town, in 1949, a former American base during World War II. The refugees were called White Russians as they opposed communism. The group, which started in Russia, also organized the Russian immigrants in China to leave, when the Communists came into power. In their appeal to the international community, only the Philippines – through the administration of then-President Elpidio Quirino – replied to their request. The offer was made even if the country was still recovering from the devastation of WWII. Tubabao Island was the designated place for the “White Russians” to stay while they wait for other countries to grant them asylum. In 1951, after two years of stay on the island, the refugees were granted asylum to the United States of America, Australia, France, and South American and European countries. “Unfortunately, this story is little known in Russia. I think we should combine our effort to let all people know that. 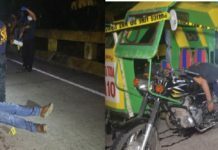 This can be a bridge of friendship, connecting Russia and all Filipinos,” Ambassador Khovaev said on November 29. “They deserve to know the story and I’m sure that many of them will have desire and will want to visit this place. Hopefully this can be our modest contribution for the social and economic development of this region,” Khovaev added. “As far as the Russian Embassy in Manila, we will do our best. I hope that in the near future that Tubabao and Guiuan will become a destination of pilgrimage of Russian tourists because this is a very special story. A story that is very close to the heart of all Russian people. We will do our best to let as many people to know that,” Khovaev added. Next year, the odyssey of White Russians to Tubabao Island will mark its 70th year, a milestone that needs to be properly celebrated. The ambassador said they will work closely with the President Elpidio Quirino Foundation on this. In his visit to this town, the ambassador went to Tubabao Island and offered prayers and flowers at the refugee marker located in the heart of the island. He also visited the old site of the Orthodox Cathedral of the Most Holy Theotokos (Orthodox Cathedral of the Holy Virgin Mary), where then Archbishop John Maximovich, who was later venerated into sainthood, served. The archbishop, now known as Saint John of Shanghai and San Francisco, was also instrumental for the granting of asylum to the “White Russians in Tubabao” in the US. Ambassador Khovaev also went to the Guiuan public cemetery to visit the graves of some of the “White Russians” who died during their stay in Tubabao. 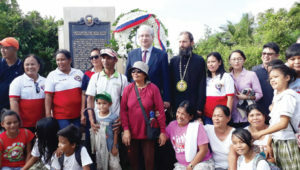 During his visit to Guiuan, Ambassador Khovaev also expressed his elation to the effort of the former mayor of Guiuan, Annaliz Gonzalez-Kwan and her daughter Kinna Kwan to conduct research to let the people know about the forgotten history of Tubabao that has a great impact on the lives of the Russian people. “I’m deeply impressed, touch and humbled. I think this is a very meaningful story because despite that huge geographical distance there is something that connects our country,” Ambassador Khovaev. Ambassador Khovaev referred to the Philippines as a “country of refuge, country of assistance and help, and country of care” when showed the documentary about the “White Russians” in Tubabao, which was produced by the President Elpidio Quirino Foundation.